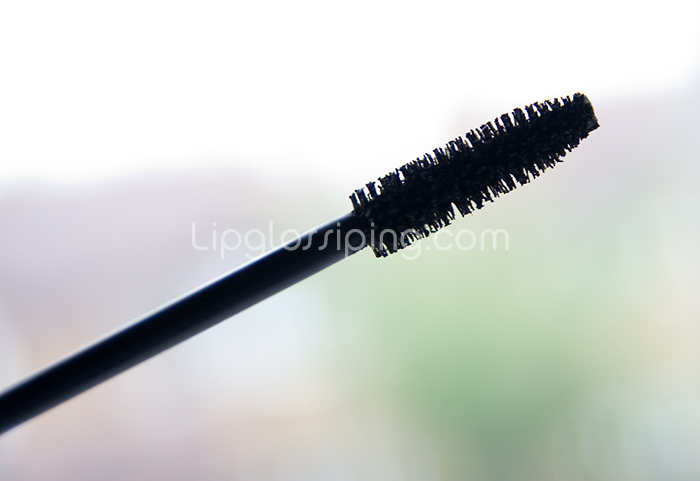 L’oreal’s Voluminous Mascara in good ol’ black. It’s one of those purported ‘oldies but goodies’ thought of in the same way as Max Factor’s 2000 Calorie. An unassuming rather plain tube greets you, indeed much like Max Factor’s 2000 Calorie. Don’t let that put you off… as they say, appearances can be deceptive. The wand is your standard bristle affair and rather large (although not as large as Bad Gal’s which seems to be the benchmark for chunky wand heads). It’s a little longer than standard which can make for tricky application on the outer lashes, but it’s not a major problem on my longer lashes. One thing I really like about this wand is the density of the bristles. They’re really packed in there which makes for some great separation. And here’s your comparison shot. No mascara on the left, L’oreal Voluminous on the right. It’s a nice deep black which offers some great volumising (as the name would suggest). I would say that there are better lengthening mascaras out there, but I could imagine that this would work great paired with one of them. I experience no flaking or smudging with this and it lasts all day long. My only gripe with this mascara is that the neck doesn’t fit too snugly around the wand, which creates two potential problems. Sometimes when I pull the wand out, there is a little too much product on the head and I also find that this mascara dries out a little quicker than my others. Not sure if this is down to the tube design or the formula itself, but it’s something to be aware of. Overall, it’s a nice solid mascara. I prefer 2000 Calorie over this (as long as I pinch my nose whilst applying the Max Factor) but Voluminous is very buildable thanks to a formula that isn’t too gloopy or clumping – if you haven’t already, check it out! I’ve always found that L’Oreal mascaras are clumpy but thiis looks good on your lashes, plus I like the brush. I bought this for the first time the other day too, i have to say so far i’m quite impressed. it does clump up a little bit for me but so far it’s bearable, it just takes a little work. @Unetasse, this doesn’t get clumpy for me unless I’m a good few coats in and I rarely bother with more than one coat. Funny how formulas do work differently for different people though isn’t it! @Lucy, I wonder if you’re both multi coaters? I should probably attempt a few good coats when reviewing mascaras to give a fair opinion on how it layers. Thanks for stopping by!